The new floral fragrance by Narciso Rodriguez. A heart of musk enhanced by a soft yet bursting floral opening. The bottle features a pale pink interior which is magnified by the purity of glass. Notes for the lighter variation on the original include cyclamen, jasmine, peony, lily of the valley, patchouli and amber. 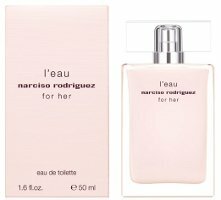 Narciso Rodriguez L'Eau For Her can be found now at Selfridges in the UK, in 50 and 100 ml Eau de Toilette. Could be! Just wish they’d come up with a new naming strategy — they all look & sound the same. I frequently am late announcing their new scents because it takes me a bit to notice that they’re actually “new”. I have liked a few and disliked a few NR fragrances. Unfortunately, I don’t know which ones were which because the bottles all look alike. I’ll try this if I can find it. Exactly! Hands down, the most confusing brand. It really is too bad. I you want try one on to see how it wears, and end up liking it, there’s no telling if you will be able to find it again to purchase. It doesn’t make any sense to me from a business standpoint. Why deliberately confuse your customers? Really, no idea. It seems like such a no-brainer to me: give your perfume a name. lol, exactly. I had to remember to ask for the black bottle which is in the pink box, not the pink bottle which is in the black box! Reason being it was called L’Eau is because the person who was meant to name it had left last minute and they were left high and dry, so they quickly came up with the name L’Eau. It was meant to be a completely new line originally, but they added it as a flanker to the “For Her” line. I don’t understand how there’s so much confusion with the bottles. The black is EDT, the pink is EDP, the metallic is EDP Intense and now the new L’Eau is a different shade of pink bottle with a clear top and is marked “L’Eau”. They’re all marked as to what is what, it just means you have to remember what you’re trying on. It’s simpler than if you were to try any Aftelier, Annick Goutal, Serge Lutens, Tom Ford, Givenchy AoD/Irresistible, Guerlain, Acqua Di Parma, Burberry, the unisex Hermes, Bond *9, Chanel (Allure, Chance, Coco’s, Allure for men), Dior Poison, Estee Pleasures, D&G anthologies, Dolce & Gabbana the one, Hugo by Hugo Boss collection, Gucci, I can keep going. There’s no way this is the most confusing brand. They are all distinct bottles and marked, despite that they are all “For Her”. LOL, Wanna piss off a fragrance associate? Next time you ask for a brand of fragrance and they ask you for which one, tell them I don’t know; From experience, this is the BIGGEST pet peeve for any associate in the fragrance industry. Get the associate to write what is where for you on a piece of paper if you can’t remember, save them their sanity, PLEASE!!!! Another pet peeve is when someone comes in and says, “it’s a bottle, I don’t remember the color, shape, name or designer or what it smells like, but it comes in a box”…Thanks for describing everything of what we have to offer. This is going to sell like hotcakes.